Discussion in 'Dogs - small breeds (toy) specific' started by courtneym, Dec 11, 2007. 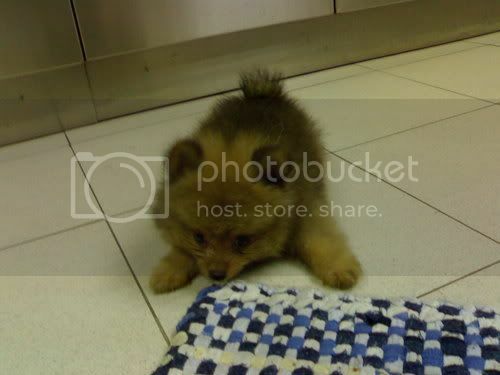 A few months back I bought a pomeranian at a pet shop for $600. Right now she's 6 months old, and her fur never really started to grow. Every other pom puppy I've seen since has had fluffy legs, and a full tail. My dog has none of this. Her hair isn't long at all, and I was wondering if this is normal in pomeranians. Or could it be possible that she's not a purebred. Her fur hasn't changed yet, she's had short hair since she's been a pup. I don't know but I've sure not ever seen one without hair. Bet she's still cute. 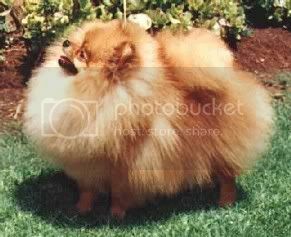 Id say you have been ripped off..Never trust pet shops, there in it for the money and money only..
Pomeranians are "Fluff" balls when there little and are fluffy when they grow up..
Have you got a picc of him?????? The thing with pet store puppies is that there's no guarantee on what you're buying as you rarely get to meet the parents and the pet stores knowledge of the breeder and the breeders dogs is usually non-existent. Your dog may be a pom mix or it could be just a badly bred puppy mill pom. If your pups ancestors had bad coats it could have been passed down to your pup, especially if the dogs were ever inbred it could make the coat faults more noticeable. Not all dogs in a litter are show quality (ie. fluffy coats, exact breed size), you can get "odd-ball" puppies. For instance, my Yorkie's parents are both standard size for a Yorkie and so is Rocky's brother, but Rocky is an oversized Yorkie (bigger than the normal Yorkie at around 12 lbs). Still as purebred as the next Yorkie, just bigger. Poms are part of the Spitz family and that group is known to go through a "ugly" stage when their adult coat is coming in and they basically have no undercoat (poms included), it could just be that that's the stage she's at now and once her adult coat comes in it may be thicker and fluffier. With pet shop buys you do not get any back ground of there history, you get what you buy..Thats it. They get hand me inns at people wanting to get rid of pups, cross breeds, etc, then they wanna make a buck out of it..
Dont support them, this may sound harsh but they are the leeches of the animal society. Its all about how they profit. My local animal shelter sells toys, and other stuff for animals and proceeds go back into the shelter, Id rather buy from them, then a pet shop. Did you see any of your Poms brothers and sisters before you bought??? Yeah, I seen her brother in the window with her. He had a flat coat too. Her fur has gotten really long since, but it doesn't stand. I've been seeing a lot of flat coated pomeranians lately, I guess it is normal? Flat coated is not in the AKC Pomeranian breed standard and should not be encouraged in the breed (a good Pom should have a thick undercoat which allows the guard hairs to stand away from it's body) , so no it is not the norm but could happen with poor breeding practices (which you see a lot of in pet store puppies - a lot of them just don't conform to the breed standard) or it could just be that they're shedding their coat for the spring/summer at this time of year. Or really and truely, it could just be that there are a lot of pom mixes in your area. My neighbors have two pom mixes that look a lot like larger black poms but they are flat coated. if your really asking this question i think you should have read a little more about the breed before obtaining it.but since you didnt, the pomeranian goes through a stage between 4-6 months where it loses its baby coat to get ready to grow in its adult coat. this is referred to as the Pomeranian puppy uglies. unless you've visited your vet and he told you its a skin problem then you dont have anything to worry about.